Ideal for use on metal doors or exterior walls where strength and security are important. Supplied in white tough powder-coated finish or self colour anodised heavy gauge aluminium. 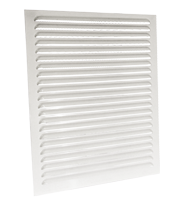 To learn more about a specific vent please use the "click here for details" to the right side of each product. 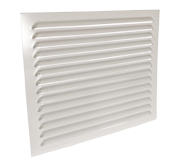 If you have any other questions regarding our large heavy-duty vents please call us at the telephone number listed in the upper right of this page or e-mail us and our Customer Service Department will be happy to assist you.